Dine stylishly pre-curtain call on contemporary American cuisine at The Hobby Center for the Performing Arts. : Dine stylishly pre-curtain call on contemporary American cuisine at the Southwestern-inspired Artista at the state-of-the-art Hobby Center for the Performing Arts. Owner Michael Cordúa is credited with bringing South American cuisine to Houston, via restaurants like Américas and Churrascos. His son David oversees the restaurant group as executive chef. 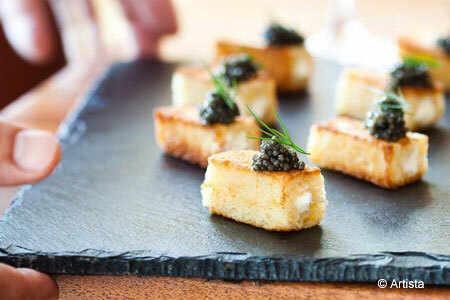 Appetizers include crawfish taquitos, empanadas and caviar "Twinkies," while larger plates range from seafood paella to beef tenderloin with chimichurri to pan-roasted chicken with mascarpone potato purée. The patio offers spectacular nighttime views of the city while you wait for the curtain to rise on a touring Broadway musical.